I was born to Filipino parents and raised in the Philippines. I moved to Los Angeles 8 years ago. Do you identify as American, Asian-American, Filipina, or Hispanic? I always say I’m a citizen of the world and a human being first. Everything else follows: Filipina, Asian-American, American, and yes, even, Hispanic. After all, the Philippines were colonized by Spain for 333 years. It has become an indelible part of the Filipino culture; it’s in our blood. Please tell us about Diwa. 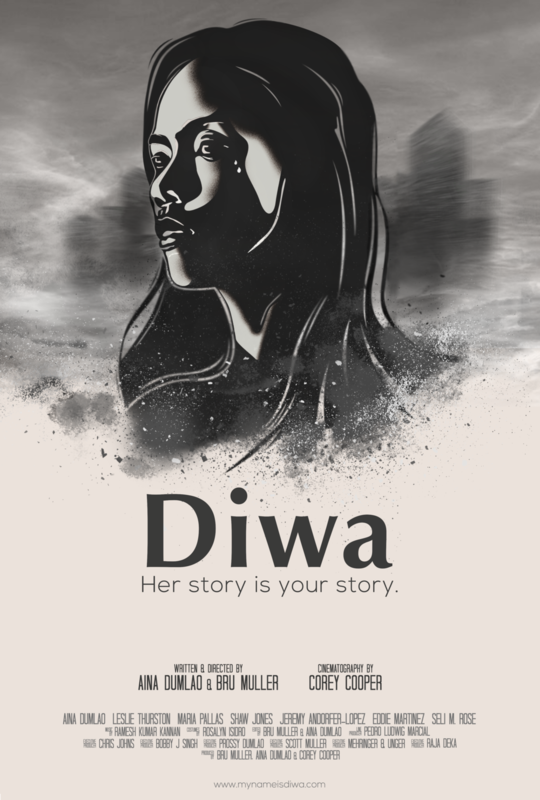 Our short film Diwa is an unflinching look at the plight of immigrants victimized by violent crimes and the obstacles they face - told through the eyes of one victim. We are an official selection at this year’s San Diego International Film Festival. Yay! We are screening on October 12, 8pm at Regal Horton and October 13, 5pm at Arclight La Jolla. How did you research for the film? And how does the film compare to the reality of Filipino immigrants in Southern California? My research journey for the film started with drawing from my own family’s experiences as overseas Filipino workers and the countless stories about Filipinos mistreated and exploited abroad. Here in California for example, dozens of stories of Filipina modern-day slaves in Orange County have recently surfaced. Where I’m from, unless you were born into privilege, opportunities for a better life are scarce. This is why 10.2 million Filipinos work overseas to provide for their families back home. And this desperation to provide for their loved ones leave immigrants vulnerable to abuse and exploitation - an all-too-common story not just for Filipinos, but for immigrants from Mexico, Guatemala, etc. The turning point in my research was when I stumbled upon a Frontline article about sexual assault of undocumented women in America. It was then that I found the heart of the story I wanted to tell. A character in the film uses the word “kababayan.” What language is it from? What does it mean? “Kababayan” means fellow countryman in Filipino. It’s a word that’s supposed to invoke a sense of home and a sense of safety and familiarity when you meet a fellow Filipino abroad. We would like to inform our readers that “kababayan’s” usage in the film is beautifully symbolic and portentous. In the film, the term “undocumented immigrant” is used instead of “illegal immigrant” during an interview. Please contrast the terms and their importance. We ask because we would like our audience to be mindful of the language they use and the political connotations words carry. Actually in the film, we used both. A pivotal character in our film, Nadine (played by the fantastic Maria Pallas) uses the word “undocumented” to refer to Diwa, but Officer Bell (played by the equally fantastic Shaw Jones) harbors a great deal of anger and resentment towards Diwa. He calls her “illegal”. The character Nadine has a sensitivity and compassion that reflects my own personal beliefs and feelings. The phrase “Illegal alien” sadly reveals a viewpoint that says “you are less deserving than I am”. It reflects a lack of care and empathy for another person that you are sharing the planet with. In today’s divided America - our laws, lawmakers, and a large portion of the population clearly embody this prejudice. But as filmmakers and human beings, we are using that same divisive language to illustrate empathy in our film for Diwa. And this is why our two main social media hashtags are #nooneisillegal and #herstoryisyourstory. Could you tell us about your personal experience immigrating to America? What the most difficult aspect of it? I’m one of the lucky ones. I had my own company back in the Philippines, a stable income, and solid credentials that allowed for a mostly smooth immigration process to America. But timing is and was everything. I strongly believe I wouldn’t have an easy experience if I would try to immigrate now. What would you reply to Americans who argue that America should reduce immigration and increase deportations so that the nation may have secure borders? Please provide a Filipino perspective, given the history America and The Philippines share. America needs immigration laws that are equal parts empathy and common sense. There are so many jobs in this country - from fruit pickers to high-level tech jobs - that Americans either do not want to take or do not qualify for. So, does it make sense to make it to make it impossible for seasonal workers to come through and earn a decent living? Does it help American companies when highly skilled workers from other countries are blocked entry? Common sense says the answer is NO. And last and most important … what do we do with law-abiding, undocumented immigrants who are already here? There HAS to be a means to protect them from abuse and exploitation. There HAS to be a pathway for them to attain legal status in America and continue to provide for their families back home. San Diego has a large Filipino community. Please list some places where we can enjoy good Filipino food. What are some of your favorite dishes? I’ve never been to San Diego but am beyond thrilled that I have the perfect excuse because of the San Diego International Film Festival. I have my sights set on Tita’s Kitchenette in National City for Filipino lunch. And oh, my favorite Filipino dish is Pancit Malabon. It is a rice noodle dish with heaps of seafood, and chicharron! What do you miss most from The Philippines?